An arts district has long been part of the city's community plan for Boyle Heights -- and something of a no-brainer to Councilman Jose Huizar, who grew up admiring the famous Estrada Courts Murals in the district he now represents. "There's so much history for the arts in Boyle Heights, from the mariachi music to the Chicano rock 'n' roll scene to the murals," Huizar said in an interview. But the area's artistic bona fides have more often been overshadowed by a reputation for gangs and economic stagnation. Changing that was one motivation for "Real Women Have Curves" playwright Josefina Lopez when she started her theater/gallery space Casa0101 on 1st Street in 2000. "Growing up, I couldn't walk to the theater and to the gallery, I wanted to create that for the youth and for the people in the community. . . . I want people to know there's more than just gang violence," she said. Others followed: Salas moved Brooklyn & Boyle out of his El Sereno house and next- door to Casa0101, and Lilia Ramirez took up residence in her gallery/studio space Liliflor Studios nearby. Suddenly, an area whose sole arts mecca had been the nationally renowned but perennially fighting-for-its-life Self Help Graphics, was experiencing a renaissance. Back in July, 2008, Councilmember Huizar (above) toured Downtown Art Walk after the ribbon cutting for Phyllis Stein Art, and was surprised at the foot traffic it generated. It may also be a warning, as the A.R.T.E.S. (Artists for Revitalizing the East Side) knows it may add to the region's identity and redvelopment dollars, it could attract "outsiders." In the article, playwright Josefina Lopez, who runs theater/gallery space Casa0101, says, "We want to make sure that people who come to Boyle Heights come to contribute and not just take. The community deserves an arts district, deserves these beautiful, wonderful things, but they don't deserve to get kicked out for it." VIEW FROM 2ND AND SAN PEDRO of the smoke from the 2009 wildfires. The South Coast Air Quality Management District issue a warning Sunday that the air near Altadena, La Canada, Tunjuga and Sunland are at Hazardous levels. ADD 9:45: Two LA County firefighters were killed when their truck overturned on Mt. Gleason. One benchmark that noted change in the city was to see people walking a dog that wasn't a pitbull after 5pm. Now it's something else. This mid-afternoon, I saw 4 sets of young couples under the large canopy of trees that overlook the city from Bunker Hill's Angels Knoll. One couple took over the now almost famous bench where Tom Hansen introduced Downtown to love interest Summer Finn in "500 Days of Summer." Other young urban types were scattered on different spots on the sloping lawn, on benches or on blankets, talking, drinking iced teas, pointing to the Historic Core skyline. Harumph. . . one couple began playfully chasing each other around the trees with water balloons. What is Downtown Los Angeles coming to? One romantic film, where the guy doesn't even get the girl, and my beloved noir-ish city stands in an a romantic urban space? I believe that many of us of who lived here for a few years see the relationship with downtown as an ebb and flow of likes and dislikes, love and hate, getting along so well sometimes, and other times not so well. You know, like any other long-term thing. Still, it was surreal to see and I didn't even take a photo. I continued on my way walking past the hill, preferring to be part of the backdrop of the city. Downtown Dining, according to Jonathan Gold. "The restaurant brings in its sausages from artisanal butchers instead of making them in-house, which theoretically leads to flexibility, and the toppings are customizable only insofar as you have the choice of sautéed hot peppers, sautéed sweet peppers or sauerkraut to put with the grilled onions on top of your sandwich." "It aims to be all things to all people, at least all people who don’t mind a sausage or two for dinner, people who think it might be a good idea to down a high-proof Unibroue la Fin du Monde or two before going back to work." Recently, nearly 150 Friends of the Los Angeles River (FoLAR) volunteers joined politicols for a river clean-up in the Van Nuys' Sepulveda Basin. 1,800 pounds of recyclable and non-recyclable items were collected, according to FoLAR, including odd items like carpet and shopping cart pieces. Shooping carts in the river is something not unfamiliar to us near the concrete LA River. The mid August clean-up was the first of two, the next taking place in Taylor Yard in Cypress Park on August 29th from 9am until noon. Volunteers can sign up at Friends of the Los Angeles River. Pictured: Young eco-scout enjoys a tour of the Los Angeles River while Mom and Friend do some clean-up. Courtesy of FoLAR. Bar with no name at 7th and Main as seen January, 2008. Ineptitude sits on a broken bar stool sharing a cheap beer with those voicing opposition for proposed Haven Lounge, the fancy bar concept that has been trying to take over the space once known as Craby' Joes. 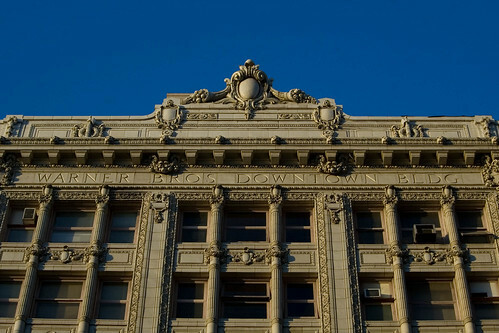 OG WB: The Warner Bros Downtown Building at 7th and Hill. Built as the second Pantages in 1920, it now houses the Jewelry Exchange. At this moment, Eric Richardson is speaking at the USC Annenberg School of Journalism. Topic: From hobby to business model. Cam pic taken by Wendy Carrillo. The Palace Theater was lit Thursday night, finally recreating its after-dark cameo appearance seen during the opening bars of Micheal Jackson's "Thriller" video. It's safe to assume that Downtown Fashion Walk, combined with Broadway and Comedy Walk, were a reason the marquee was on. 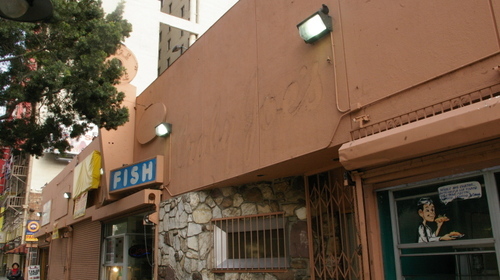 On a previous post, reader Dennis Smith notes the storefront signage "that appears just to the right of the Palace marquee is the same as it was in 1983 when Michael and Ola made their exit on to the street of a mostly deserted downtown after dark."